So hello and welcome to the blog, as it says in the about section the reason for myself and Chris creating this blog is that if you look out there on the internets you’ll find all manner of blogs on fossil organisms from dinosaurs to mammals and everything else if you go on Tetrapod zoology! But you will find very few on fish, yes that’s right those extremely common vertebrates (representing some 27,977 of the 54,711 known vertebrates, that’s over one-half!!!) represented by some 515 families both extinct and extant. They are possibly the most morphologically diverse group of vertebrates; I mean think about it look at a Knightia alta, a Plaice (Pleuronectes platessa), a white shark (Carcharodon carcharias) and a Alligator gar (Atractosteus spatula) figure.1 (I haven’t even mentioned seahorses! ), they are all extreme shapes, it seems a little unkind to say “well fish are fish shaped” too such a fantastically diverse group. They also inhabit a wide range of habitats from the polar oceans to the muddy banks of mangrove forests. Not to mention exhibiting a huge range of bizarre and fascinating behaviours. Fig. 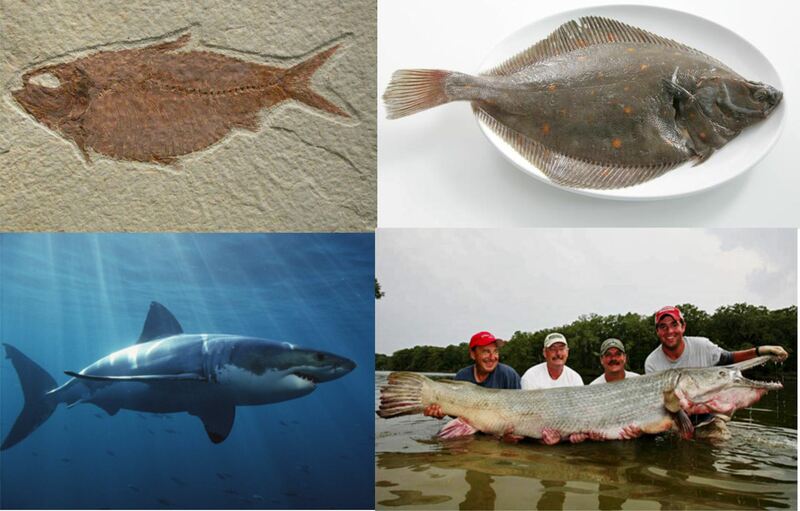 1 (Top left) Knightia, (Bottom left) White shark, (Top right) Plaice, (Bottom right) Alligator gar. Now some of you cladistics fans will be shouting “but what are fish?” and “Fish don’t exist” and yes it is true that fish are a paraphyletic group this is because they are “basal” their characters can be found in a wide range of vertebrates making it hard to identify them as an actual group, “fish” is a colloquial term, however I think we’re going to have to write a blog post about this topic all on its own. Now if we take the wonders of extant fish, we can only imagine what fossil fish over the last 500 ma must have been like, and this is the plan of the ancient anglers to inform and entertain about fossil and at times extant fish topics that interest us, important papers and cool things about fish. Anyway that’s about it from the this first post thanks for staying for the ride hope this gave you a flavour for what is to come from myself and Chris, the posts may be a bit sporadic for the first few months as we find the time to write these but hopefully we should have at least a couple a month. This entry was posted in Uncategorized and tagged Fish, ichthyology, Palaeontology, Paleontology by ancient anglers. Bookmark the permalink. Wonderful to see, I look forward to the fantastical fishy festivities!